Darren McGarvey has experienced poverty and its devastating effects first-hand. He knows why people from deprived communities all around Britain feel angry and unheard. And he wants to explain . . . So he invites you to come on a safari of sorts. But not the kind where the wildlife is surveyed from a safe distance. This book takes you inside the experience of poverty to show how the pressures really feel and how hard their legacy is to overcome. Arguing that both the political left and right misunderstand poverty as it is actually lived, McGarvey sets out what everybody - including himself - could do to change things. 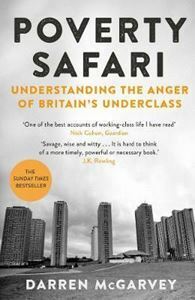 Razor-sharp, fearless and brutally honest, Poverty Safari is an unforgettable insight into modern Britain.